Spring is just around the corner, which means fashion, like nature is going through a most welcome revival. We can now start dreaming of warmer days and put a lot of colour in our wardrobe and our make-up. Nail polish is one of the best ways to enlighten your outfit and showcase your mood, especially with the new trends for this spring. What better way to stock up on every colour you need than to use your Boots promotional code? Now, let's see what nail polish trends and shades are in for this new season. Variety is the spice of life and it seems to be the keyword for spring looks. 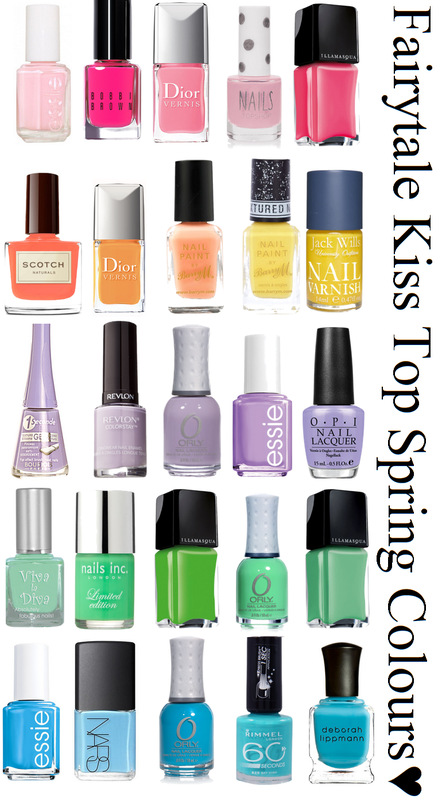 When it comes to nail polish, many different styles are emerging, starting with pale colours. White nail polish is a must-have this season, giving your nails a classy, natural look that matches most of your outfits. Any type of neutral tone works, for a soft, elegant touch. I love these colors!!! Have a great week end. Xoxo V.V. Love them! Dior and Nars have such lovely colors! Lovely idea, really enjoyed seeing your picks! Love some of these shades, the Deborah Lipman blue is gorgeous and the pink from Bobby Brown will look gorgeous with a tan, some great picks! Excited for pastels! Great post! those are definately spring colors alright! Great post! like these colors! btw green orly is mine! Ohh really? It's a gorgeous shade!